formerly the raw carrot salad with currants and walnut oil, i present the peasant (okay no but kind of) version, creamy curried carrot salad with walnuts and sesame. everything got eyeballed, as per usual for my non-baking adventures (and even then i tend to eyeball the vanilla). i used extra virgin olive oil instead of walnut oil, because i didn’t want to buy walnut oil. raisins instead of currants because again, that’s what i had. cranberries could work too. and you could plump them, but i didn’t. unintentionally forgot the cayenne; nbd because i can’t handle spicy things anyways. that doesn’t stop me from shoveling in mouthfuls of dukbokki before downing massive amounts of water (yes, i know california is in a drought). tried shaving the carrots with a veggie peeler (i was trying to avoid using a box grater); it didn’t work. i made matchsticks instead, which still took a while because i was trying to make thin matchsticks. no need to feel like a total rabbit. added sesame seeds because why not, added toasted walnuts to make up for the lack of walnut oil. ignored the flaky sea salt and stirred kosher salt into the whole shebang. i won’t lie, this creamy curried carrot salad is kind of weird at first. but it grows on you, fast. the yogurt is shockingly creamy here. i’m sure some of it is attributed to the oil, but to me the oil’s major contribution is the fruitiness it brings. the moisture softens the carrots a bit, so that the carrots retain their crunch without being hard. it’s really nutty from the sesame and walnuts, and i thought them, along with the curry, added a nice warmth. if that makes any sense. there’s just a hint of curry; i added enough where it’s a whisper instead of POW CURRY. which makes sense because iguodala seemed to have more starpower than curry at the end of it all. i don’t really care about bball or the warriors and yes it’s been about a month since they won, but hey, you gotta root for the bay when you can. Whisk 1/2 cup whole milk yogurt, 1/4 cup extra virgin olive oil, 1/4 tsp curry powder, a pinch of cayenne pepper and 1/4 cup plumped currants/cranberries/raisins. 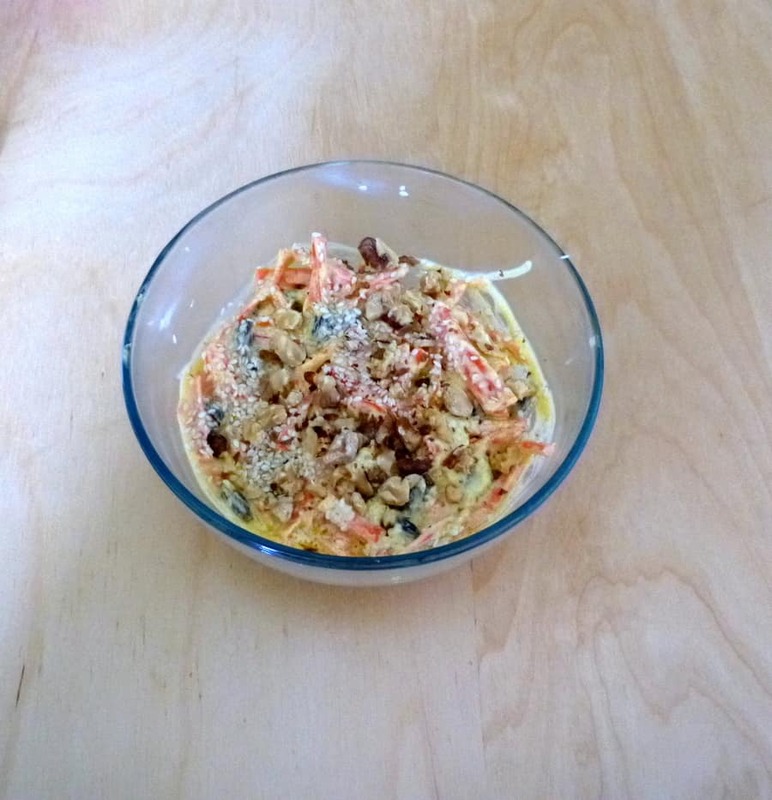 Stir in 1/2 lb peeled and finely shredded carrots, 1/2 T toasted sesame seeds and 1/4 cup toasted, chopped walnuts. Season with flaky sea salt. The flavors in this are all so unique, and very intriguing. Excited to give it a try and hopefully it will grown on us like it did on you!